The documents in this product can be used while reading the story or following a reading of the story. Students will be challenged to recall facts, identify problems/solutions and facts/opinions, and use higher level thinking skills to apply what they have learned. You can use the pages combined as a packet or as three different assignments. 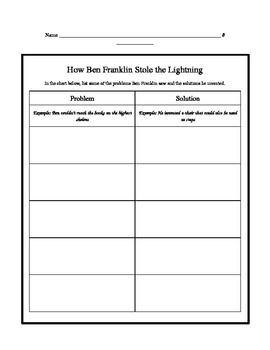 *This story by Rosalyn Schanzer sparks students' imagination and teaches them about one of our country's founders, Benjamin Franklin.